By: Shawn C Baker on 28/02/2014. While talking to my friend John about music recently Brian Eno came up. John’s older than me and had the enviable experience of being into music while Eno was releasing his records. I own a few of those records and in this internet age am familiar with more. I can honestly say I love everything I’ve ever heard that’s been published under the man’s name, but the thing with Brian Eno – as my conversations with John continually attest – is that he has had his hand on so very much music. Roxy Music, the glorious solo records, Talking Heads, U2… hell, even Cold Play has an album produced by him (and you can feel his sonic fingerprints all over Viva La Vida). Then there’s the fact that band’s like Bauhaus and St. Vincent have covered his songs. The influence and the actual blood, sweat and tears this man has put into popular music viewed from where I sit today typing this is just staggering. But with all the reading, conversation and sonic scavenger hunts that have informed me on Brian Eno there is a record that I’ve found many of us Eno fans are unfamiliar with. 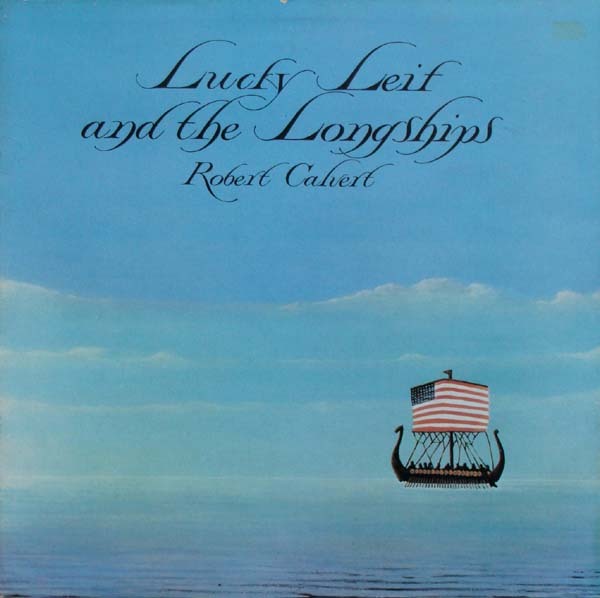 That record is Robert Calvert’s second solo record from 1975, “Lucky Leif and the Longships”. Lucky Leif and the Longships is something John mentioned to me in the heat of one of those aforementioned Eno conversations. The record piqued my curiosity, not just because Eno was involved but because it is something of a concept album, one that deals with a world where Vikings were the ones who made it across the ocean and settled America first. Developing out from this Calvert and Eno employ a host of musicians in assembling a very unique pedigree of musical material – much of which was very ahead of its time in terms of arranging, the way in which it develops its story and the genres it invents to do so. Case in point is track #2 “The Lay of the Surfers”. This is a Beach Boys-esque surf song, done in a way that it is completely aware of the fact that in this alternate timeline Calvert and Eno have set up the Beach Boys as we the listener know them would not exist – instead of being All-American good boys The Beach Boys of this alternate history would be the products of their Viking forefathers. The end result? Musically ingenious and completely hysterical. These are the kind of antics that bands like the Mother of Inventions and Mr. Bungle influenced my friends and I to make in many of the iterations of our Schlitz Family Robinson project, and here it again, though laid out with that dry English wit and the wonderful Eno-centric textures of one of the master producers of our time. Oh, and TAG – Chester Whelks! Man, i had never heard of this album before. It’s really cool. Well played Shawn. Well played.